Ken Napzok is bringing us a new book! Not your typical Star Wars novel that takes you on a galactic adventure, but a book where we can sit down and appreciate everything the Star Wars universe has given to us. Why We Love Star Wars: The Great Moments That Built A Galaxy Far, Far Away is a shared story of fandom. Classic moments include: • The first shots of the ragtag Rebels running from the monstrous Galactic Empire • Young Anakin winning the podrace • And the first time we saw the crackle of Luke Skywalker’s lightsaber. I’m looking forward to Ken Napzok content because I know that while he, like other fans, can have his issues with Star Wars, he always sheds a bright and positive light on the simplest to grandest things in the galaxy; Whether it be Dexter Jettster, Death Star plans, or character dissection, Ken holds that information near and dear to him and for him to share that with all of us is truly a pleasure. I’m hoping the book expands on moments like a 50’s diner or a lightsaber battle, or an explosion, because to me simple, intricate, or otherwise, all moments can make Star Wars great. I’m also excited to see what Ken sounds like on the page since I constantly listen to podcasts he’s in. If you have no idea what I’m talking about, head over to Podcast One for Collider Jedi Council, listen to ForceCenter wherever you get your podcasts, and honestly just search his name cause he’s got great content everywhere! 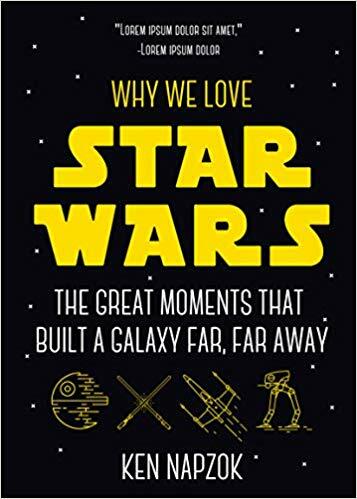 Get Why We Love Star Wars: The Great Moments that Built a Galaxy Far, Far Away on May 15, 2019 or Preorder Now!